In need of discussion questions to start off John Knowles' timeless coming of age tale- A Separate Peace? Gene Forrester returns to his alma mater, the Devon School, and recalls events that occurred there in the summer of 1942, when he formed a competitive friendship with his roommate, Phineas (Finny), the school's best athlete. 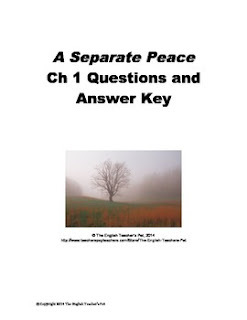 A classic story of innocence and guilt, this set of Chapter 1 study questions for A Separate Peace is a must have for your class. Ready to print and pass out today! Please visit my store to purchase the novel set of A Separate Peace Chapter Questions and Answer Key! A Separate Peace Introduction PowerPoint. A Separate Peace Essay Questions and Rubric. A Separate Peace Chapter Questions and Answer Key.